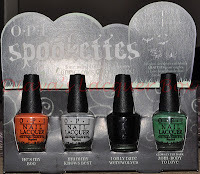 Next Up: A Halloween themed mani, using one of the nail decals! This is, by far, the best picture of a glow in the dark polish I've seen this past month. It looks great. So maybe GITD polish looks best over white? kyaaa, I thought it would fade fast and only shine a little bit but this looks pretty strong!